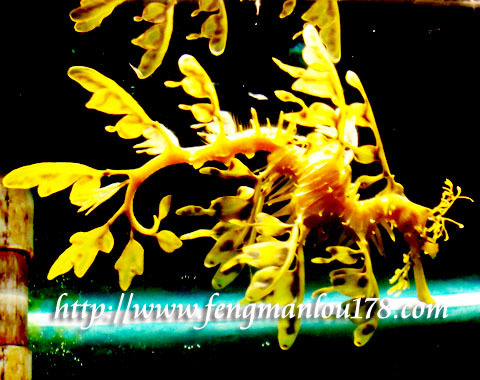 Leafy sea dragon is possibly one of the amazing and mystical ocean fish. The waters of southern and western coasts of Australia are ideal habitats for leafy sea dragon. Although leafy sea dragon is closely related to seahorse and pipefish, its body is larger and with leaf-like appendages. The leaf-shaped appendages enable leafy sea dragon to hide among seaweed. Leafy sea dragon generally is yellow or brown in color. By propelling the pectoral fins, leafy sea dragon moves slowly in water. Leafy sea dragon feeds on tiny crustaceans such as mysids, plankton and amphipods with its long pipe-like mouth.